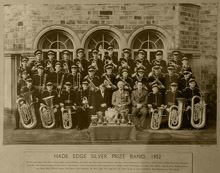 Hade Edge Band has a proud history and with thanks Peter Badham and Robert Turnbull the following gives a chronological history of the band from 1908 to the present day. 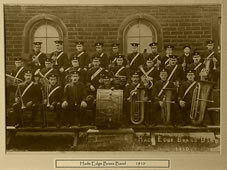 Hade Edge Band is the youngest of the five ‘Valley Bands’ Hepworth, Hinchcliffe Mill, Holme Silver, Meltham and Meltham Mills, and Hade Edge. It was formed in July 1908 by a Sunday School committee of brass band enthusiasts, who wished to revive the movement in the district after the demise of the Old Moss Band a few years previously. Instruments were collected from ex-members of the Old Moss Band and rehearsals started under their first conductor, Allen Swallow. The band’s first conductor received the princely salary of £1.10s.0d. (£1.50) per annum. Ben Charlesworth was appointed secretary and his job was to raise funds to provide more instruments and new uniforms. About £5 was raised at a garden party when a goat kindly donated by Jonathon Hirst was roasted. It was this incident that prompted the design of the band’s logo of a goat’s head. The band’s first balance sheet in February 1909 showed a balance of £43 with cash in hand of £2. 6s.3d. The band’s first public engagement was in 1909 when they met the victorious Underbank Rangers Football Club at Holmfirth Railway Station. They marched and played “See the Conquering Hero” non-stop up Dunford Road to the club’s headquarters. The first few years were difficult but by 1912 many new instruments had been purchased. At that time a new Eb Bass cost just 15 guineas (£15.75), the same instrument today costs up to £4500! 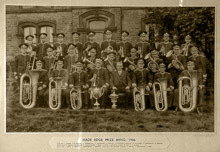 The band’s first prize came at a contest in 1914 at Stalybridge with conductor William Pollard from Derbyshire, who was by then the Band’s first professional conductor. At that contest a 12 year old Albert Robinson was showing great promise in the cornet section. This first success spurred the Band to make plans to enter the 1914 Crystal Palace contest. The test piece was “Poet and Peasant”, but the outbreak of World War 1 cancelled the contest. During the war and immediately afterwards the band fell on hard times, but things improved slowly and by 1924 the band were looking for a place of their own having all this time been using the Sunday School to rehearse. A secondhand Army Drill hut was purchased from Leeds and erected in Greave Road (then School Lane). Some bandsmen contributed £50 each towards the cost which was a truly considerable sum for a working man in those days. Other money raising plans were made culminating in a grand dance held at the new bandroom on Christmas Day 1924. Online casino WhiteBet https://kasinok.net/en/best-online-casinos-uk/whitebet.html allows its visitors choosing one of 3 (or all three!). Wilfred Greaves was appointed Bandmaster in 1920 until 1927 when Albert Robinson, who was by then the band’s principal cornet player, succeeded him. Day to day life during this time was hard but despite illness William Pollard took the band to the Pudsey Contest in 1928 and they won 1st prize from an entry of 14 bands. The following year came the crowning glory when the band won the 1929 Holmfirth Contest. July 1932 saw the band’s first appearance at the Belle Vue Contest. Although unsuccessful in their section the band took part in the March and Deportment Contest involving bands from all sections and took 1st prize playing the March “Harlequin”. The Second World War struck a great blow to the band, but the band managed to continue with engagements both concerts and contests with Albert Robinson as the resident conductor. The Holmfirth Contest was however abandoned for the duration of the war. At the end of the war things improved quickly and the band had a new president in Mr Leonard Baddeley who provided his companies coaches free for contests. William Pollard had been re-engaged as professional conductor until 1947 when George Hespe was appointed to take the band to The Daily Herald North Eastern Area Contest at Huddersfield Town Hall. Rehearsals had just begun when the Great Snow came and cut off Hade Edge for several weeks. Leonard Baddeley came to the rescue allowing the band to rehearse in his coach garage in Holmfirth. This obviously paid dividends as along with Markham Main, Hade Edge qualified for the finals at Belle Vue in Manchester but sadly Hade Edge were unplaced at the finals. Leonard Baddeley’s enthusiasm, kindness and generosity were brought to an abrupt end when he died suddenly in the autumn of 1947. Arnold Lancaster was appointed as his successor but within a year he had died and the band’s long association with William Haigh began. In June 1947 the band attended a contest in Harrogate where they won 1st prize. The following month’s “Brass Band News” gave the band credit for winning, but commented on their “shabby” uniforms. This led to another money raising campaign to purchase a new set of uniforms at a cost of £511.3s 4d. The new uniforms were worn for the first time at the 1949 Holmfirth Contest which the band won. The 1950’s brought great success with Albert Robinson at the helm, perhaps his greatest success was winning 4th Prize at The Daily Herald All British Championship Second Section Contest at London’s Kensington Town Hall on 25 October 1957. In 1952 Sam B. Wood became an admirer of the band and he wrote a signature March for the band which incorporated the Holmfirth Anthem as well as the band’s name in musical notation in the opening bars. The Albert Robinson era came to an end in 1958 when he left to conduct The Lockwood Band. 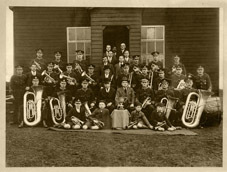 He was succeeded by three bandmasters in three years; Harold Swallow, Fred Beever and Frank Longley, the latter with Edmond Hoole as professional. During this time the band qualified for the London Finals in 1959, and in 1961 Kenneth Aitkin Jones became Bandmaster remaining for three years with Cedric Battye succeeding William Haigh as President. Frank Gledhill became bandmaster in 1964 but was unavailable to take the band to a contest in Chesterfield in 1969 when the committee approached Jack Fisher to take them just for that contest. Although they did not win they were impressed and asked him to become their permanent conductor. The band improved immediately and won the Holmfirth Contest in 1970 and again in 1971 with the expectation of achieving the first ever hat trick in 1972 when unfortunately they came 3rd to Hepworth Band. However they returned the following year to win in 1973 and again in 1974. During this remarkable period the band qualified for the London Finals in 1971, 1972 and 1974 gaining their best ever result when they were placed 3rd in 1971. The band, albeit for only a few years, had its first taste of life in the Championship Section. Joseph Dickinson became President of the band in 1971 and was succeeded by his brother Edgar in 1981. Jack Fisher continued with many Contest successes including winning BBC Radio Sheffield’s “Bold as Brass” competition in 1982 and ‘83 and runners up in 1984. Jack hosted a request programme on BBC Radio Sheffield, leaving the band after a few years and sadly lost the battle with Leukemia in 1990. 1984 to 1988 saw the band’s fortunes fall as membership dwindled. During this period the first tentative moves to build a new bandroom at a projected cost of £100,000 were made. Efforts to apply for a Lottery Grant fell at the first hurdle! It took over two years to sort out ownership of the land and building as the Deeds were in the names of the 12 founding members of the band and not in the band’s name. 1988 brought the arrival of Barry Hudson as M.D. and the membership picked up again. The band led the bi-centennial Denby Dale Pie celebrations that year as they did again in 2000. 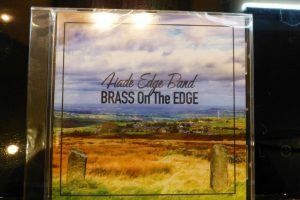 Hade Edge made its first trip “overseas”- true it was only to the Isle of Man to an Entertainment Contest, but it helped to put the band back on the road to further improvement. A five year association with Eric Landon as M.D. began in 1992. A new influx of players began and another steady improvement with the band winning the Area Contest in 1985 and representing Yorkshire at the Wembley Conference Centre Finals. The following year the band became a Registered Charity. The band fell on difficult times after Eric Landon left and in 1997 an emergency meeting was called to see if the band had a future. With the encouragement of Edgar the band decided to soldier on. Barry Hudson was re-engaged but the band had little success. Barry left at the beginning of 1999 and a new man was sought. After helping the band out for a few weeks Simon Wood was appointed as M.D. and with the band back down in the Second Section the long road of rebuilding the band began again. 2000 was a year of recruitment and consolidation. The band remained in the Second Section at the Area Contest when they achieved 11th place. The impetus of 2000 was carried through to the 2001 Area Contest when the band qualified for the finals, gaining second place at the Yorkshire Regional Contest. The band achieved a creditable 5th place at the National Finals in Preston. Later that year the band played to packed houses in a production of “Brassed Off” at Huddersfield’s Lawrence Batley Theatre. The now stable band, with full attendances, approached the 2002 “Areas” with an increased confidence which was fully justified when they took 1st prize. Even more intensive rehearsals followed before the band set out on the long trip to Torquay for the National Finals. All the band’s hard work was rewarded when the band were crowned National Champions of Great Britain 2nd Section 2002. Now promoted to the 1st section, the 2003 “Areas” represented a new and even bigger challenge. Again the band responded with a 2nd place and another trip, this time to Dundee for the finals. The band were placed a disappointing 12th position. The following year, 2004, the band was placed 5th at the “Area” contest ensuring promotion to the Championship Section. The year 2007 found the band returning back into the 1st section and in the 2008 Area Contest the band were placed a disappointing 10th place- that’s contesting for you! However, 2008 was a year to remember at Hade Edge – the band celebrating 100 years of banding based in the village. The band celebrated their 100 years of existence with a concert in Huddersfield Town Hall in July of that year. The concert was a “free” concert for all, and of course as expected the Town Hall was full. The audience were entertained by not only the Senior Band whose birthday it truly was, but the Training band, Junior band, Jazz band and Community Choir along with our guest soloist for the evening – David Childs- euphonium player with Cory Band. A commemorative programme was produced and a Senior Band CD produced called Up the Old Stone Steps a reference to the old band room entrance. By the end of the 00’s the bands website was becoming well established and noted for its variety of information covering all the Hade Edge groups- a move into the 21st century. The end of this decade saw the Senior band enter the Durham Miners Gala regime on behalf of the village of Sacriston, and the junior groups continuing to grow in numbers with the result that the bands constitution was updated to reflect the changes at Hade Edge. Our wonderful new band room which opened in 2007 was also fast becoming a venue for concerts; used by other bands in the area and Two Valleys Internet Radio station broadcasting from the band room for a whole weekend towards the end of 2009. 2009 saw the Senior Band reach the National Finals in Harrogate in the 1st Section once again. At these finals a pre-contest dinner was held in a Harrogate hotel and two senior band players were recognised for their long service to the band – Bob Eastwood and Robert Moorhouse. They both continue to be active players of the Senior Band in the 10’s. A successful end to the 00’s for the Senior Band. The Junior Band was formed in 2002 after Simon went around local schools demonstrating various instruments and invited children and parents to a meeting in the bandroom. Expecting no more than a dozen to turn up we were overwhelmed when more than 60 of them filled the bandroom. Edgar to the rescue! Instruments were found (some more battered than others!) and The Honking Hedges formed. They have flourished and grown into the Hade Edge Youth Band and another training band – the Tree Honkers- was formed in 2005 to accommodate more youngsters wanting to learn to play. A Junior Jazz group and a Community Choir were set up in 2006, meaning a total of 150 children and 40 adults taking part in all forms of music. A really remarkable achievement for a small village band. The groups continued to grow between the years of 2006 and 2013 to include a Percussion group, Saxaphone and Clarinets and various Rock School groups. At the end of 2013 the Academy left the Hade Edge Bandroom and moved to Brockholes near Honley (see History 2013). During the summer of 2004 the band played at Oxenhope station on the Keighley & Worth Valley Railway at a vintage steam day. A film crew were making a promotional video and asked if they could include the band in their production. A conversation followed in which the idea that they might make a documentary about a year in the life of a brass band was born. ITV agreed and a five part series called “Yorkshire Brass” was screened in 2006. the series gave people an insight into the hard work and dedication that is needed to succeed. The new decade started well for the Senior Band with success at the Regional Contest in March 2010 and therefore a return to the Championship section of banding. 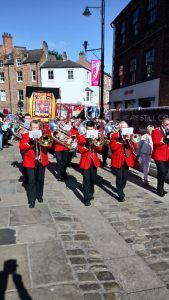 The Senior Band returned to the Durham Miners Gala in July and presented the Sacriston Banner into Durham Cathedral for the re-dedication service. A memorable day for those band members who attended. During the year 2010, the General Committee set their stall out to work on the procedures required of a new building with over 200 members entering the doors on a weekly basis. This involved Risk Assessments and ensuring the facility met the necessary Legal compliance for both band members and the public. At the AGM in March 2010, Peter Badham our Chairman for the past 25 years stood down due to ill health and Robert Turnbull took on the role. Peter was made a Vice-President of the band. Peter sadly passed away in May of that year. Later that year (December) our other Vice-President, Phillip Wright, also passed away. Peter, Phillip and Edgar were instrumental in the building of the new band room. Two important members of our organisation sadly missed. Peter’s ashes were laid to rest, along with a tree being planted in his memory, in one of the borders of the car park at Hade Edge Bandroom. The Senior Band entered a new contest for them in September 2010 at Hardraw Scar in the Yorkshire Dales and the band came 2nd overall in the contest. The Community Choir continued to gain in strength and engagements with Sarah Turnbull as their permanent conductor. Sarah being a versatile and professional conductor who was Kirklees Musician of the Year a few years before. Edgar Dickinson – our President – invited the Senior Band to play at his granddaughters wedding at The Inns of Court in London in April of this year. The event was pure magic with the church famous for being featured in the “Da Vinci Codes”. The year continued with the band being invited to play in Huddersfield Town Hall with over 200 male voices for a concert in aid of Yorkshire Cancer Appeal – Philip McCann being the guest soloist, and raising over £7k for the Charity. The Youth Band, now renamed from the Junior Band, entered the contest arena at the National Youth Brass Band Contest and were well placed. Heather Badham (widow of Peter) agreed to become a Vice-President of the band. The “junior” groups now included a Youth Band, two training bands, a Junior Jazz group, a Community Choir and a Percussion group. It was decided by the General Committee that the Junior groups would be re-named. From June 2011 a new structure was agreed – Hade Edge Band for the Senior Band and Hade Edge Academy was formed to encompass all the other groups within Hade Edge – all under the baton of Simon Wood – MD. Sadly in July 2011 Edgar Dickinson, the bands President and benefactor for over 10 years sadly passed away. Edgar was remembered at a funeral service to celebrate his life in Holmfirth Parish Church where the Senior Band played and the Wake held at the Edgar Dickinson Building (the band room). A Marquee was erected and covered the whole of the car park area in order to accommodate over 400 people attending his Wake. Edgar was a true Yorkshire gentleman and apart from the band he had an active life after retirement within the Masons movement, also President of New Mill Male Voice Choir and a huge supporter of Kirkwood Hospice in Huddersfield and many more smaller organisations. Hade Edge Band in just over a year had lost its President and two Vice-Presidents, all of them major players and influencers achieving the dream of a new band room and ensuring the future of Hade Edge band was secure and its continuance within the village of Hade Edge. Towards the end of the year the Senior Band and Youth Band entered the first ever ‘Brass Factor’ Contest in Holmfirth. The event was based on the popular TV show X Factor with a panel of Judges. this was pure entertainment with the audience being the deciders of the Contest winners. The Senior Band became the first winners of this new ‘brand’ of contesting. 2012 was another busy year for the band with highlights including Senior Band players taking part in a week long theatre show of “Brassed Off” at Keighley Playhouse and the Senior Band and Community Choir joining together to hold a Fund Raising Concert in Holmfirth Parish Church in aid of the Roy Castle Cancer Fund (Roy and his relatives in the area had close links with HEB over many past years. In July, Senior Band attended the 128th Durham Miners Gala for the village of Sacriston. A busy summer was followed by the Senior Band entering the Bolsover Entertainment Contest for the first time and winning “Best Soloist” prize for Flugel player Aaron Wood. At the Hardraw Scar Contest in North Yorkshire, the heavens opened just as the band were going into the open air arena – the music had to be peeled off the stands afterwards but they still came away with Joint Entertainment prize. Once they had dried out the band had to dash back to entertain the crowds at the homecoming of GB Olympian – Ed Clancy- who won a Gold Medal at the 2012 London Olympics in the cycling. As usual, Christmas is a busy time for any band and amongst all the busking and Christmas concerts, the Senior Band and Community Choir found the time (and braved the cold) to entertain the crowds at the Huddersfield “Festival of Light”. Although MD Simon Wood’s jokes still didn’t seem funny to the Huddersfield crowd, despite the festive good cheer and fireworks!!. And sadly, the final legacy to Edgar Dickinson took place in December on the traditional Sunday prior to Christmas Day when the Youth and Senior Band played at Edgar’s Barkisland venue – this would be the last time this event took place. The year began with ambitious plans for the Band Room, hoping to make extensive internal alterations to the Band Room by enclosing one of the balconies in order to make a new rehearsal room which would be virtually soundproof. It was commissioned and building commenced and completed by the middle of the year. The Band Room also opened its doors to the inaugural “Top of the World” festival, where a full weekend of arts and music took place in the band room culminating in a Concert with the Senior Band and guest from Norway – the Vestawind Bergen Band and Brighouse born guest artist Roger Davis singing and playing the guitar. To increase the use of the band room by the local communities, other events held at the band room included, “Edgy Nights”, a series of open mic events, gave performance opportunities to local and young performers and the Holme Valley Contest committee held their 3rd Annual Slow Melody Contest at the band room for the first time. The Youth and Training Bands both competed at the National Youth Band Championships during April held at the Royal Northern College of Music, Manchester and in April the Senior, Youth and Training bands all competed in the Holme Valley Contest in Holmfirth – a busy day for MD Simon Wood. May was a busy month with the Youth Band and Senior Band competing in the Morley March Contest and the Senior Band took to the stage in Huddersfield Town Hall alongside local Massed Ladies Choir Concert in aid of Yorkshire Cancer Research Fund. A first for organiser Norman Mellor who over many years has staged events in the Town Hall for the Research Fund. In September, the Senior Band competed once again in the Hardraw Scar Contest and became overall champions of the contest winning the Landlord of the Green Dragon Pub Shield. In November the Senior Band took to the stage in Huddersfield Town Hall once again this time in aid of BBC Children in Need to present their “pop” programme – which went down a storm with the audience. The same programme saw them crowned winners once again at the “Brass Factor” in Harrogate and runners up in the same contest in Holmfirth Picturedrome later in the month. And finally, the end of the year saw the Senior Band say “goodbye” to their conductor Simon Wood who had been with the band for over 10 years. At this time, the Academy groups also moved location to new premises in nearby Hope Bank, Honley. The new conductor from January 2014 would be local conductor Jonathan Beatty and the Senior Band look forward with much anticipation to the forthcoming years ahead. The 2014 band awards were announced at the band party held in January in the band room. New Conductor, Jonathan Beatty’s. first contest run out with the band was at the Yorkshire Areas in March. The band played well but were placed 11th in the First Section which meant that come 2015 contest they would have to be placed well up the section to avoid being relegated to the 2nd Section of Brass banding. Not deterred by this result, the band put on a sterling performance at the Holmfirth Contest playing Music of The Spheres. This resulted in them coming away with a total of 8 trophies including the trophy for the Outstanding Conductor of the contest for Jonathan and the Best Soloist Prize being awarded to our Euphonium player , Ivan Conroy, a longstanding player of the band. Still on the contesting stage the band returned to Hardraw Scar in September and came away with four trophies including the trophy they won in 2013 (The Landlords Shield). For their final contest of the year, Jonathan took the band to Leicester Contest in November. a new venue for the band. They were placed 4th out of 15 bands – a satisfying end for the band on the contesting stage and for their new conductor Jonathan Beatty. A new venue for the band to perform concerts came about through one of the bands life members, Douglas Barrowclough, whose daughter and husband run The Carding Shed at Hepworth. Douglas’s brother, Alton played in the band during the 60’s/70’s. In 2014 the band performed three concerts to full houses and at one of the concerts they were joined by a previous player who currently plays for Black Dyke Band as their Principal Horn player- Jonny Bates whose father Graham Bates along with Ronny, Grahams Dad were linked with the band throughout the 90’s and early 00’s and are supporters of Hade Edge Band. At the Christmas Concert at The Carding Shed the band invited Denby Dale Ladies Choir to take the stage with them. 2014 was one of the busiest years the band had experienced for many years with a new lease of life, new regime in place and a great deal of effort, time and organising put in for it to succeed along with nurturing a new conductor who began bringing into the band more competent players and filling the vacant seats. Now onto 2015 where success at the Yorkshire Area Contest In March will be the first major test for the new conductor in order to avoid the drop from First to Second section banding, not experienced at Hade Edge since 2002. 2015 was the year in which the band and committee put into action their 3 year plan of continuous improvement for Hade Edge Band as a fully integrated organisation. 2014 was a year of consolidation following the major changes that took place in December 2013 and the effect this would have on the future of Hade Edge Band. With plans for the band to continue its upward progress as a First Section Band within the recognised structure of the National Brass Banding in the UK, off to Bradford for the second time with our new conductor, Jonathan Beatty, and the band were placed 4th in their section playing A London Overture. Following disqualification of the band that came 3rd place, Hade Edge were moved into 3rd place and in the prizes/trophies of the Yorkshire Regional Championships of GB. An achievement not seen in Hade Edge for sometime this century. The band continued its success on the contesting stage by winning the Rochdale Contest in October of this year and then at Leicester Contest in November coming 4th. Throughout the year a number of “key” seats were filled with new players joining the band as a result of the influence of our new conductor Jonathan Beatty. As to concert events, The Carding Shed venue was again a favoured one for the band to play to full audiences at now four concerts over the year (two being in December). Joint concerts with Colne Valley Male Voice Choir, Honley Male Voice Choir and a number of ladies choirs in the district, notably Vocal Expression in Holmfirth Civic Hall and Penistone Ladies Choir where the band played alongside them at the famous Paramount Cinema in Penistone (one of the oldest private cinemas in the country still going). 2015 was the year when the band committee gained four members from players and a more integrated committee was established to run the bands affairs. At the AGM in March 3 new members were elected and Heather Badham (widow of Peter Badham) was made a Life Member of the band. The committee reported that in 2014 the bands finances remained in good shape as they broke even on income v expenditure. 2015 saw the Edgar Dickinson Building used by Kirklees College for Adult Learning Classes covering upholstery and sewing. This bringing in much needed income for the band and the maintenance of the bandroom to survive in the absence of any sponsorship for Hade Edge Band. A further highlight of the year for the band was when they attended the Durham Miners Gala on behalf of the village of Sacriston, an association now in its ninth year. The village had finally achieved their goal of purchasing a new banner and by doing so meant that it would be dedicated at a service in the Cathedral during the afternoon of the Gala at which the band played the new banner into its place in the Cathedral and following the service led it out again and back into the streets of Durham for the crowds to see. A proud moment for all band members who attended this event in 2015 and a very happy group of villagers from Sacriston. The baton for the Hade Edge “B” Band passed from John Turner to Michael Crowther and finally to Gary Perrin by the year end. Progress with new members and their playing was achieved with greater plans to expand this group and provide them with an identity of their own in 2016. Grants received in 2015 were from the Holme Valley Masonic Lodge so we could replace the first generation Geneva cornets with the second generation cornets and a further donation by Bernice Wright (widow of Philip Wright) for us to purchase a Geneva Flugel instrument and at the year end a grant from One Community Foundation (Grassroots Longley Farm) Grants so we could purchase garments for our newly formed “B” band in 2016. The year ended with high expectations for the band to make further progress in the First Section League of Brass Banding with their next visit to Bradford and the Regional Contest in March 2016. For the first time for many years Hade Edge Band were listed in the top 200 International Rankings of Brass Bands at 147th place. 2016 – A year of Consolidation. The year began with the band attending the Yorkshire Regional Championships in March. The result was not what the band had hoped for as they were placed 11th and therefore would mean they would need to achieve a top 6 placing in 2017 to avoid relegation unless of course other bands results went in their favour. Contesting this year went well with the Senior Band taking honours in the Rochdale Contest and outright winners of the Y&HBBA contest held in Holmfirth in November. The B band also competed in this contest for the first time and came away with a creditable 3rd place. Concerts were held at The Carding Shed once again and for the first time in the village of Carlecotes with a Garden Party and Christmas Concert in their village church. The band continued to make changes in its player formation in order to strengthen certain sections of the band in preparation for the 2017 Yorkshire Regional Championships in March which were to be held in Huddersfield Town Hall for the first time in many years of this contest. 2017 – An interesting year. The Yorkshire Regionals result in March was a disappointment to the band. Even though they played well the adjudicators came down on them and placed them 10th. This now puts the pressure on the result for March 2018 as the band will now be at risk of being relegated to the Second section. However the rest of the year was good for the band. New players of quality joined throughout the year and we continued to entertain crowds at Carlecotes village in the summer and again in December in the church. 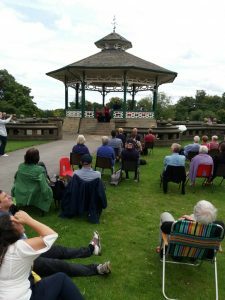 New venues for the band in 2017 were at Greenhead Park Bandstand which “Friends ” of the Park were making every effort to regain the summer feel of brass band once again. In October the band recorded their first CD for over 10 years and their first with new MD Jonathan Beatty. It went on sale in December and sold over 100 copies by the end of the month. December saw the band playing at new venues around the Holmfirth area and good crowds were in attendance. The 70th Anniversary of the Bolsterstone MV Choir tragedy that hit Holmfirth in 1947 was celebrated with a concert in the Parish Church with the band and choir. 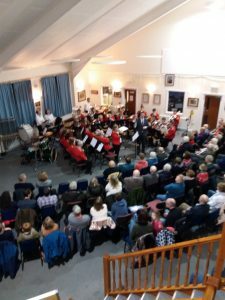 A sell-out concert and £2000 was raised at the concert and split between the local RBL and The Friends of Holme valley Hospital. A very moving evening was had and to end the evening the choirs coach went back up the hill to the pub in Hade Edge – stopped and had a pint or two with the locals and the band members. A new friendship was gained by all. Joint concerts during the year included Penistone Ladies, Denby dale Ladies and Horbury Singers- all enjoyable evenings. The band had excellent results in contesting at Rochdale and Holmfirth during the year but their first time at Buxton for a few years was disappointing. The band ended the year preparing to go into 2018 fighting with the Yorkshire Regionals looming in March. The Band room continued to be used for various activities and further sound proofing was funded to continue to improve the sound quality. A new group headed by local composer, Sandy Smith, Tubular Brass made use of the band room many times throughout the year and an association that would continue into 2018. A new venture for the band room was planned to commence in January 2018 with the Hade Edge Baby and Toddlers Group making use of the band room during the day to held fund the cost of maintaining our treasured asset Hade Edge “B” Band continued to make good progress and in November the MD’ship transferred to one of the senior band players, Jonathan Mitra. The “B” Band entered the Y&HBBA contest in Dewsbury Town Hall in November and gave a very creditable performance which was remarked on by both the adjudicator and contest management. Also in November of 2017 the Trainer Band was formed (for complete beginners) and headed up by Amy Ellershaw also from the Senior Band. After an Open Day that was held in October full rehearsals began in November and currently up to 10 new players to brass are regular attenders. .
2018 The Bands 110th Anniversary Year..